Click for Fall 2012 edition. Click for Spring 2013 edition. 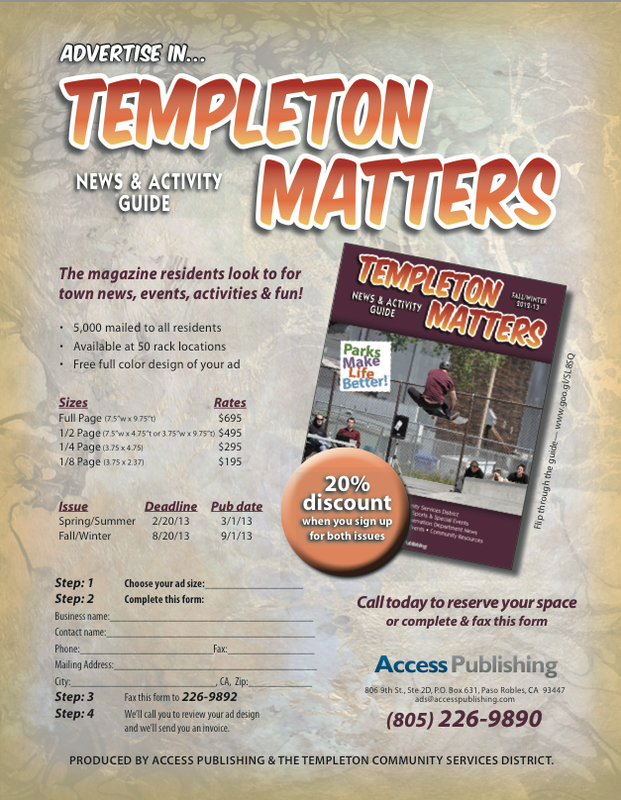 Templeton Matters is the magazine residents look to for town news, events, activities and fun. It’s the official publication of the Templeton Community Services District. Its produced by Access Publishing. 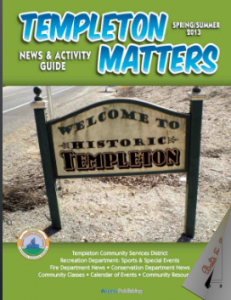 Sections inside Templeton Matters include business news, special events, recreation and sports, fire department news, conservation department news, calendar of events and community resources. The magazine is the primary way for the community services district to distribute information. It is delivered twice a year to all the residents in Templeton. More than 5,000 copies of Templeton Matters are mailed and available for pick up on 50 racks locally. It’s a great way for local businesses to advertise and reach families and residents in Templeton. The rates are really reasonable and advertisers get a 20-percent discount for doing both editions. It also includes free design and full color. A flyer is attached with more details and prices. 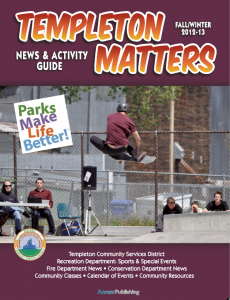 Click here to flip through a current digital edition of Templeton Matters. To advertise, call Access Publishing at (805) 226-9890.